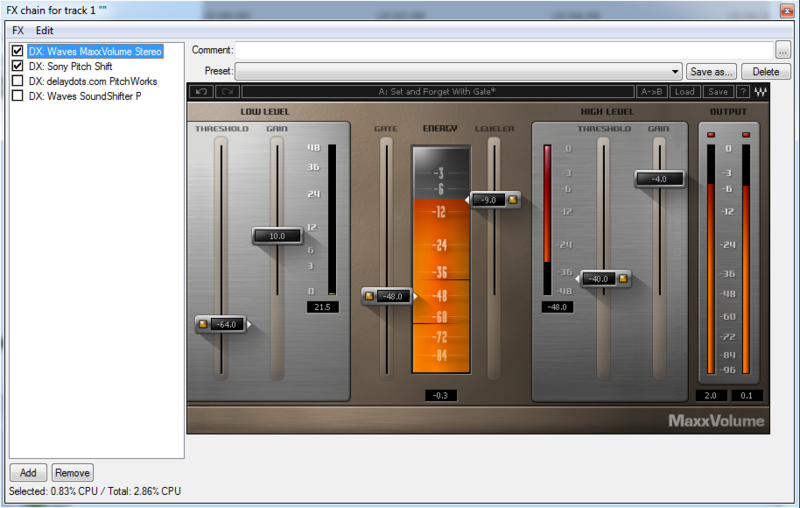 Starting with v1.5.043, TKaraokePro will support sound effects using VST Plugins. This feature comes with lot of features as the user can config their own Plugins to get the effects they want. 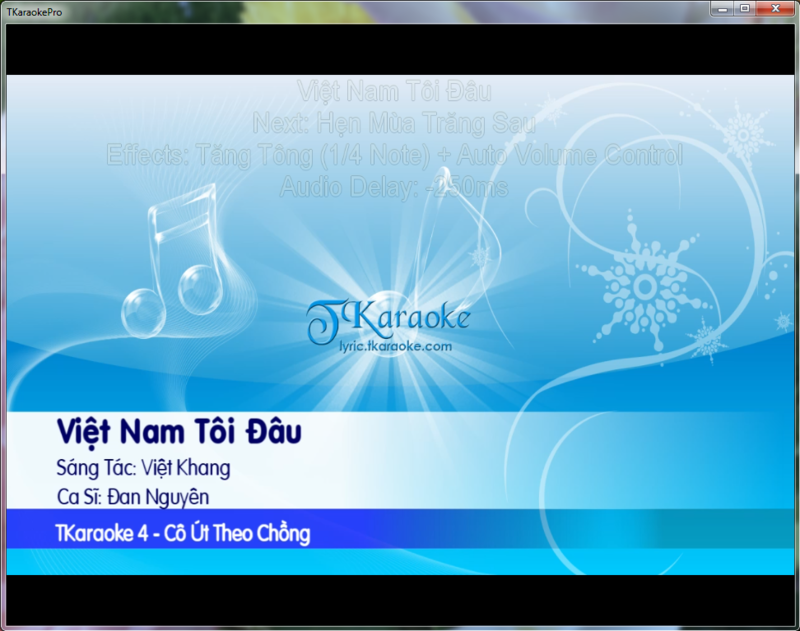 TKaraoke will will ship with a free plugin to support pitch shifting (đổi tông nhạc). Users are encourage to use their own non-free plugins to achieve better pitch shifting accuracy and other advanced plugins. To use this new feature, the user must install the following. In the near future, the requirement of Virtual Audio Cable (VAC) will be lifted but as of build 043, VAC is required to function. You'll have to try a trial version of VAC or buy it for now. Contact Ng&#224;y Nắng Mới or tkaraokeuser for help obtaining VAC. See the tutorial video below for help with setting up this feature. Clearer version of the video can be viewed here. Double-click on VAC to install it. Install your favorite plugins. To install the free PitchWorks plugin, double-click on it. Double-click on Reaper to install it. After it installed, run it and uncheck "check for updates" and exit it. 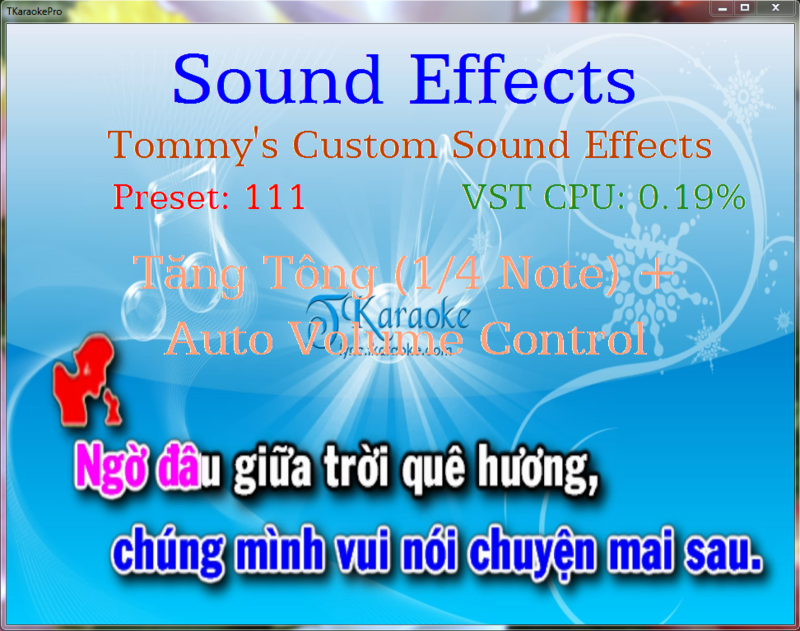 See this topic for preparing your PC to use VST Effects in TKaraoke. If watermark is enabled, at the start of every song, the current effects will be displayed. The current audio delay time is also displayed. The Audio Delay can be changed via the Sounds Effects Preferences. 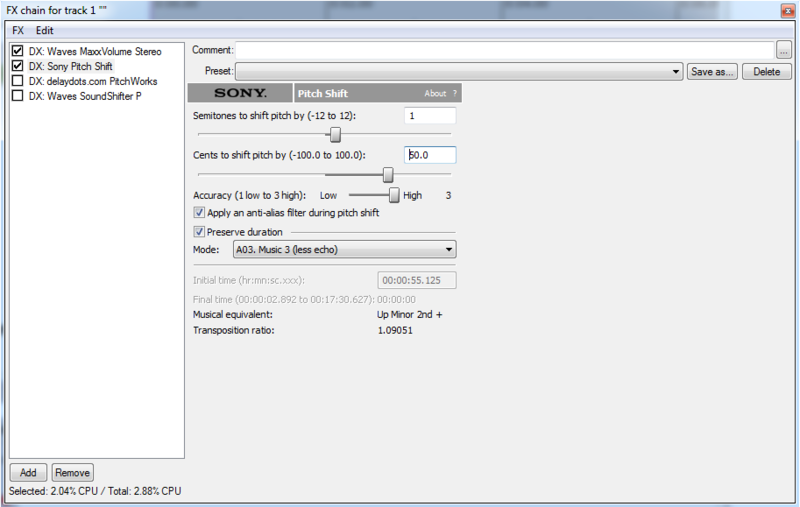 The total delay time will be the delay specified in this Preferences screen plus the delay of the current effect preset. For example, if the Audio Delay on the Preferences is -250ms and the delay of the current preset effect is -100, the total delay will be -350ms. Due to licensing, we can't ship advanced effects plugins with TKaraoke. If you have the effects installed on your computer, you can configure your own presets and have TKaraoke apply these effects when you sing. 5. Open the file !Effects.tkvstconfig using Nodepad or an XML editor. Note that all the presets are defined here. Each preset has an associated RPP file. This file is the Reaper Project File. You can open these files in Reaper and add/remove effects and save them. TKaraoke use your updated preset the next time you run TKaraoke. As an example, I modified the default "!Default.RPP" and add some bass and bright to the music. After I'm done, I want to close the FX window of Reaper and save the project. When you are totally done with editing your effects, you want to save all your project files and run TKaraoke and click on Options-->Audio-->Sounds Effects and do the following to make sure the Reaper Window doesn't appear on top of your video when singing. You'll only have to do this once after making the Reaper Window visible for editing your own effects. A1: Go to Options-->Audio-->Sounds Effect and click on "Make Reaper Visible" to bring out Reaper. On Reaper, click on Options-->Preferences and select Device. Under Input Device, select "Virtual Audio Cable 1". 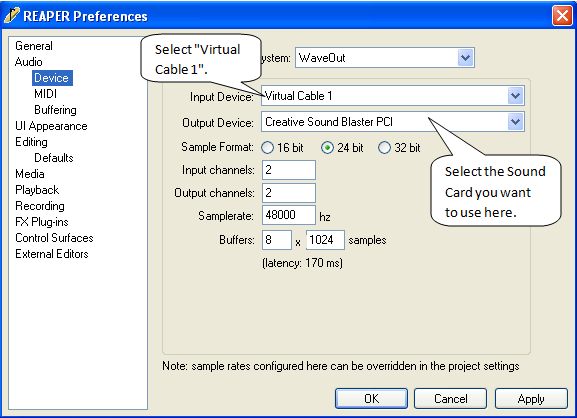 Under Output Device, select your sound card device (i.e. Creative SB X-Fi). In Windows's Sound Control Panel, make sure the default Playback Device is set to "Virtual Audio Cable 1". Q2: When I apply a new preset, I see the Reaper window for a few seconds. How do I fix this? I use the Waves's MaxxVolume compressor to achieve Auto Volume Control. 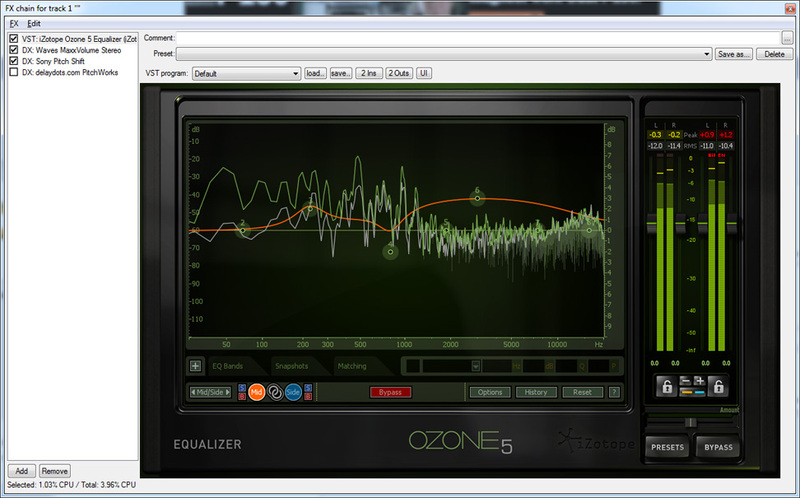 It's a Dynamic Range Compressor so it would result in better audio normalization than the function provided by VLC. Note that you use Reaper's UI (screenshot above) to configure the effect (or effects chain) but once you are done and saved the project file, you won't see the reaper window ever again. TKaraoke will apply the effect behind the scene. Any other useful effects that you guys typically use? 5 users thanked Hai Lúa for this useful post. Thanks T . Demo video posted. Note that in the video, the audio is a little lagged behind. I recorded this using my iPhone5 and somehow, the audio is a little out of sync. You can tell in the video that I talked a little after the actions in the video cuz the audio is lagged behind. Awesome! This is what I have been waiting for! Too bad I haven't had time to sing karaoke in a while. Very nice job! 1 user thanked AZNguy for this useful post. I have not tested the vocal routing above so I'm not sure it it's 100% correct. VAC is a loop-back device (hardware implementation: feed line-out back into line-in, software implementation: Virtual Audio Cable or similar driver). The software approach for loop-back is pretty nice and the number of connections is pretty much unlimited. It also has no loss in quality because it just pass the same bytes from one device to another (hardware cable always incur some signal loss). I haven't tested this out yet but this suggestion of yours does make sense and look promising to me. But w/ this setting, I guess the Recording feature will not be put into place, correct? Nice anh Vz! Great job@! 1 user thanked CaliMoon for this useful post.